Lotus Cars is a British manufacturer of sports and racing cars based at the former site of RAF Hethel, a World War II airfield in Norfolk. The company designs and builds race and production automobiles of light weight and fine handling characteristics. Graduating from City last year with an Automotive and Motorsport Engineering MEng, Sean Canty is now on the graduate rotation scheme at iconic British automotive and engineering company, Lotus Cars. 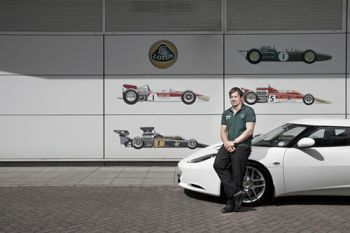 Sean, who has completed two rotations on the Lotus scheme, has seen first-hand how development work and engineering take place for some of the world's most famous motoring brands. 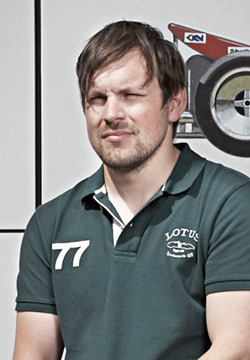 "During my first placement in the electrical department at Lotus I was responsible for the design of a low-voltage wiring harness for the Rolls-Royce Phantom 102EX," explains Sean. "The 102EX is an electric vehicle developed for Rolls-Royce by Lotus' consultancy division, Lotus Engineering." In his most recent placement he is developing control software for the Lotus Evora IPS (Intelligent Precision Shift) automatic gearbox. Prior to Lotus, Sean spent a placement year with Rolls-Royce where he developed manufacturing capability of metal matrix composite compressor rotors for gas turbine engines. This formed one year of his five-year course at City, the highlight of which was leading the design team that built and raced two Formula Student single-seater race cars. How did City prepare Sean for the wider world of engineering? He credits City for the balance of theory and practical learning: "The practical skills we learn come from a wide range of design projects run at City. The teaching is always at the cutting edge of technology and the course is very modern and relevant." He also credits the careers support he has received: "I have had help every step of the way from cv, interview and assessment centre assistance, to the very useful volunteering opportunities available that help build experience."